Equipped with a MSM4 1,2 GHz processor and a range of innovative wireless features: WiFi 802.11 b/g/n, Bluetooth 4.0, GSM / GPRS / EDGE / UMTS / 4G LTE, GPS, it stands apart from everyday consumer products thanks to its remarkable sturdiness (IP65, multiple 1.2m drops on to concrete, a functioning temperature range of between -20°C to +60°C and its outstanding battery capacity. Thanks to its fully-optimised weight, size and feel and its large 4.0” high-resolution colour screen, the AGX A-One offers excellent ease-of-use, even in full sunlight. With this in mind, we have chosen to install the Android Operating System. Adopted extensively by Smartphone users – often the most demanding – for its intuitiveness, spontaneity and the simplicity of its man-machine interface, it allows our clients and our partners to develop or to port high quality software applications. In addition you can add a pistolgrip with additional 5.000mAh which add in total of 8.800mAh and gives an outstanding autonomie. Before the AGX A-One, customised products which integrated technological components aimed at specific tasks were heavy, sizeable, unattractive and expensive. 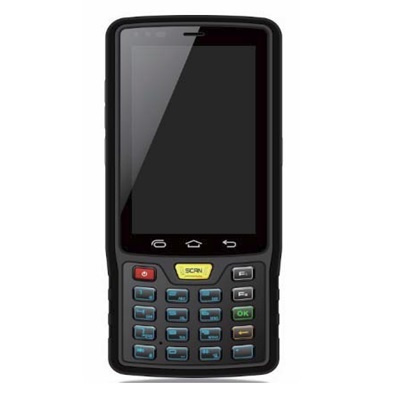 Thanks to its modular System the AGX A-One can integrate and connect: 1D or 2D barcode scanner, RFID readers and antennas (of all frequencies), biometric sensors, and so on, thus becoming a PDA perfectly suited to the needs of its users, whatever their requirements.